Introducing the world’s first Hybrid Facial now available in Dublin! 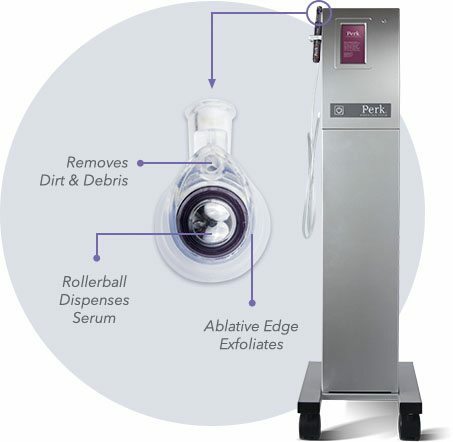 Perk™ is the the first Facial to merge a professional in clinic exfoliating treatment with a take home product! Using an exfoliating tip and a roller ball, pores are gently flexed as the rollerball embeds nutrients into the skin revealing a fresh new you! You get immediate results and long-lasting benefits that fit perfectly into your daily life and your bag! How does the Perk work? Receive your professional exfoliating treatment to quickly remove the dead skin cells while simultaneously replenishing vital antioxidants and nutrients. Take home the Perk applicators from your treatment to enhance benefits and give your skin an added boost anytime. Perk is a simple and quick way to boost your lips, replenish your eyes or give your skin that extra glow in just a few minutes! Or get all 3 for just €120!